Simran Garg of Siliguri has made the name of Siliguri proud in Amity University-Noida, Uttar Pradesh. 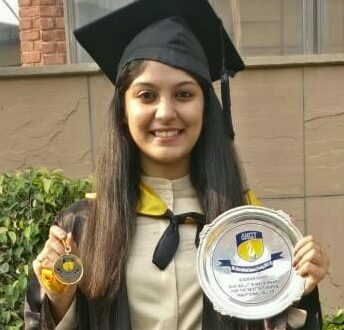 Simran Garg, who doing a bachelor course in BBA International Business, has got a gold medal in academic qualification and has bagged the top position in the BBA IB department of the entire university. An accomplished dancer, Simran, was top not only in her studies but also held the highest values in culture and traditions and thus achieved the ‘Baljit Shastri Award-2018’ for Amity University’s most prestigious traditional values. This exemplary success of Simran, the daughter of poet and social worker Shri Anil Agarwal “Shriram”, has elevated the name of Siliguri city and the entire family.